A festive Linlithgow Speakers last night when we were delighted to have a very special and magical guest last night. We did not have a Rudolph to guide us nor a sleigh! But we did have the Big Man himself, Santa Clause, in the role of Toastmaster. We were asked to wear something festive and would you believe it, 2 members turned up in the same kind of jumper. Note – not the SAME jumper because that would have been a bit crowded. Things got a bit serious for a while as Avril started her 10th Speech, Inspire your Audience, by talking about her year of researching slavery and uncovering despicable working conditions. She was inspired to set up a new charity, Protect and Improve Santa’s Helpers (PISH for short). Yes, thank goodness, the mood was lightened as the audience discovered she was taking about Santa’s elves and went on to include almost every elf joke and pun in the book (elf and safety, low elf esteem etc). Her favourite was the glitter flatulence! To keep the festive Linlithgow speakers mood going, Euan read us a Christmas story for the interpretive reading manual and had us all hooked on its complicated and imaginative language. A lovely story beautifully read. The best part of the evening had to be Julie’s table topics. She had wrapped up presents for us all and tied to each one was the festive question. We are all panicking as she has set a high bar – what next, I wonder! Everyone told their personal stories and we all learned a lot from each other. Well done to Julie as the first time in this role. I don’t think “contranym” was used much, we had only a few ums and ahs and we were mostly on time (except for the 2 speeches!). Thanks to everyone who took part in the meeting and all it remains is to wish everyone a great Christmas, a fabulous New Year and a brilliant 2018. 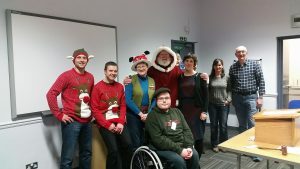 Looking forward to next Christmas when we can have another Festive Linlithgow Speakers!